Two Greeners are helping to shape urban development on the West Coast. Gil Kelley, on Portrero Hill, is at the helm of San Francisco’s citywide planning. By sidetracking a plan to figure out what he wanted to do in life, Gil Kelley ’79 discovered his calling. In April, he was named San Francisco’s director of citywide planning, his latest post in an urban planning career that began even before he graduated from Evergreen. It’s a career that came about because of a destiny-changing detour Kelley took in the early 1970s that put him in North Bonneville, Wash., a Columbia River town facing imminent upheaval. Shortly before his departure, a high school friend, Michael Mills ’77 (profiled in Evergreen Magazine’s fall 2009 issue), invited him to come to North Bonneville before heading to California. Mills, an Evergreen sophomore, was working on a big project in the town with his urban planning program, and he wanted Kelley to check it out. We were empowered to learn about urban planning and activism. be demolishing the community to make way for Bonneville Dam’s second hydroelectric powerhouse. Kelley applied for the position and was accepted. He enrolled at Evergreen, ditching Brown and his poetry-writing trip. The effort was an unprecedented case in which the displaced townspeople, armed with the students’ research and assistance, fought to stay together—rather than be disbanded. They gained federal legislation obligating the Corps to pay for the design of their new town to be carried out under the community’s control. Kelley lived and studied in North Bonneville, eventually becoming a senior planner with the planning department. “I was hired when I was a junior, working as an intern,” he said. After the relocation was completed, he finished up his studies by taking a political economy program at Evergreen’s Olympia campus. In the mid-1980s, he began working for the City of Berkeley, eventually becoming its chief of planning and development, a job he held for a decade. During his tenure, he led efforts to revitalize the downtown area and West Berkeley’s more industrial, mixed-use district (one in which diverse activities such as living, shopping, and working are in close proximity). Willamette riverfront industrial brownfield into a high-rise, mixed-use neighborhood, as well as the rebirth of the city’s streetcar system, and planning and urban design projects for the Pearl District and other neighborhoods. He also created Portland’s River Renaissance Strategy to restore the health of the city’s rivers, streams, and watersheds and redevelop the shorelines to improve public access. In the five years between his stints as chief planner for the cities of Portland and San Francisco, Kelley went to the Harvard Graduate School of Design on a prestigious Loeb Fellowship, was a Lincoln Fellow at the Lincoln Institute of Land Policy, and obtained a mid-career master’s degree in urban studies and planning from the Massachusetts Institute of Technology. He loves teaching, something he does every fall in a University of Amsterdam master class on planning and negotiation for senior-level European planners. He also assists the American Planning Association with training new planning directors, and he is a practitioner-in-residence at Portland State University’s Nohad A. Toulan School of Urban Studies and Planning. 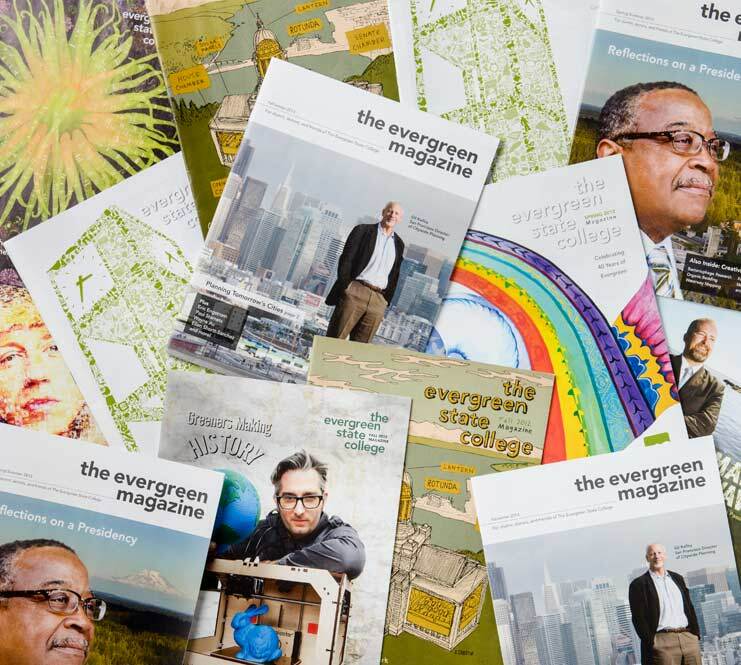 In the dynamic metropolis of San Francisco, Kelley is applying more than 35 years of experience in city planning and administration—beginning with the revelatory one he had with Evergreen in North Bonneville. He has a staff of 45 and focuses on managing the development of long-range plans and improving urban design and planning policies. He resides in the Hayes Valley neighborhood, and tries to live with the lowest possible carbon footprint. He doesn’t have a car and walks everywhere, including to work. “I now live in a 10-minute neighborhood!” he said. Although Kelley abandoned his dream of becoming a poet, he does write, a skill he developed with Evergreen faculty direction. He’s at work on two books—one on the idea of “the intentional city,” a vision involving collaborative governance to create great urban places, and another on 20-minute neighborhoods—when he finds the time, that is. Mostly, though, he’s working “to make things better,” another “central skill” learned at Evergreen. “It empowered me to solve problems in a creative way,” he said. Portland Principal Planner Eric Engstrom at one of the city’s aerial tram terminals. Photo by Shauna Bittle ’98. Over the past few decades, Portland has earned acclaim for its forward-thinking approach to such facets of city life as urban growth boundaries, public transit, biking, and neighborhood parks. This approach—emulated by municipalities around the globe—even has its own name: The Portland Model. With a population of 600,000 and growing, the city isn’t resting on any of its planning laurels. It’s tackling current challenges, including issues related to changing demographics, social disparities, congestion, employment, and climate change. And it has a longer-range vision of how it wants to be in the year 2035, when forecasters predict nearly a million people are likely to call it home. This vision is articulated in the Portland Plan, the city’s strategic roadmap for future growth and development. Eric Engstrom ’91, a principal planner for the Portland Bureau of Planning and Sustainability, played the lead role in orchestrating the initiative, from start to finish. A city planner who had a rural Oregon upbringing, Engstrom oversaw the development of the plan, an effort of supreme collaboration that has roots in his Evergreen education. One of Portland’s fast-changing riverfront neighborhoods. He worked on the project—along with his staff of 15 and scores of other people at public agencies operating in the city—for four years, until the City Council unanimously adopted the finalized plan in April 2012. It was shaped by several years of research and fact-finding; the creation of more than a dozen background reports; a few hundred community meetings, with both grassroots organizations and elected leadership; 17,000 comments from residents, academics, businesspeople, nonprofit leaders, and other community members; and the cooperation of 30 local and state agencies and organizations. The plan is unique not only in its inclusiveness—citizen participation was a key component in its development—but also its focus on equity as its core principle and the foundation for its other major goals: fostering the prosperity, health, and education of every Portlander. All of these priorities were identified through the involvement of the community. In September, the plan’s Healthy Connected City strategy won a City Climate Leadership Award from the international C40 Cities Climate Leadership Group and Siemens. This strategy calls for bringing so-called complete neighborhoods to 80 percent of the city’s population by 2035, up from the current 45 percent. In a complete neighborhood, residents can easily access everything they need— schools, shops, jobs, parks, pubs, etc.—without driving. Since moving to the city, he’s worked on a variety of land use and strategic planning issues, including infill development strategies (to further develop vacant or underused parcels within already-developed areas), protection of urban natural areas, and reforming zoning codes to make it easier, for instance, to build accessory dwelling units or put solar panels on historic buildings.